Google Earth got a big update on the web and Android earlier this year. Today, Google released the same features for the iOS version of the app. The update features four major additions to Google Earth. 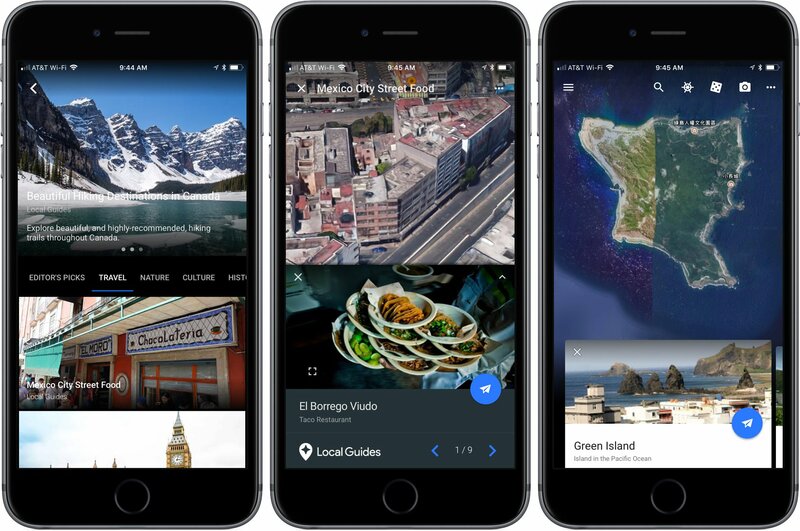 ‘Voyager’ is designed to help you plan your next trip with over 140 stories organized by topic like ‘Museums Around the World,’ ‘Mexico City Street Food,’ and ‘Beautiful Hiking Destinations in Canada.’ When you pick a location, Google Earth offers ‘Knowledge Cards’ that you can pull up from the bottom of the map. Cards include galleries of photos for your chosen locale as well as basic facts and links to Knowledge Cards for points of interest and related searches. If you’re at a loss of where to go, tap the ‘I’m Feeling Lucky’ icon in the toolbar and Google Earth will whisk you off to a random destination to explore. Finally, ‘Postcards’ is a basic screenshot utility built into Google Earth. If you find a map angle you like, tap the camera icon to create a link and screenshot and share it with the iOS share sheet. Oddly though, you cannot share Postcards via Messages. Google Earth is available on the App Store.